Get the message out the parents of 2/4 year old that they can receive (if eligible) up to 15 hours per week free childcare. The campaign was very targeted into areas where families were more likely to be eligible, so this went right down to postcode areas. Bus Interiors were selected on routes around the target areas targeting Parents with young children. Lower Rears on buses on routes around the target areas, as well as main arterial routes into and out of the city. Doctors surgery screens were used where detailed messages can be delivered in a trusted environment. Their are lots of parents with babies and toddlers in surgeries! 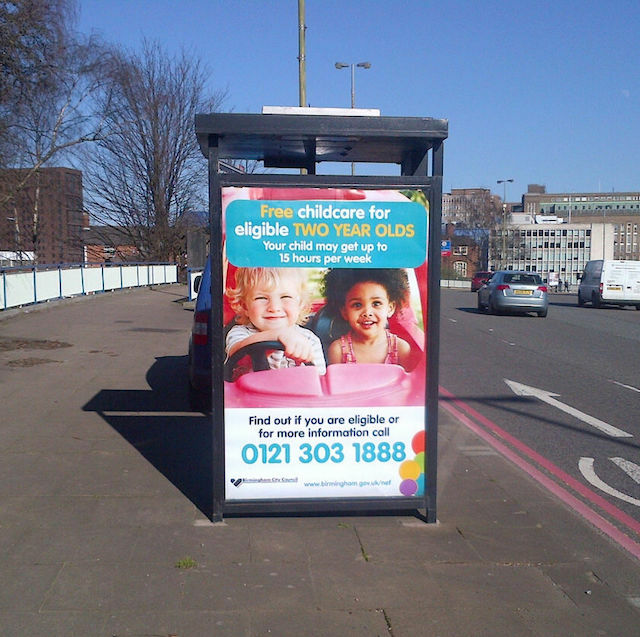 Bus Stop advertising and selected 6 sheets in specific target postcode areas. Shopping Centre 6 sheets stratgeically selected outside retailers like Mothercare, Mamas and Papas, Boots the Chemist were prime locations where Mums and Dads will be walking in and out. Streetalk Kiosks allowed us to get right into the heart of the communities being targeted. The media delivered the messages right where the target market lived. The multi format approach ensured the message hit home and the creative was simple, clear and effective.